This study was performed to investigate the effects of desmotomy of the Navicular Bone Suspensory Ligament (NBSL) on navicular bone radio-morphometric features and on navicular bone remodeling in normal donkeys (Equus asinus). Twenty normal healthy, adult, local breed donkeys, between 5 and 7 years of age and weighing 120-150 kg were used. Three radiographic views (lateromedial, dorsopalmar and palmaroproximal- palmarodistal oblique) of navicular bones of the forelimbs were taken of experimental (n = 15) and control animals (n = 5) before and after desmotomy and every 4 weeks thereafter for 12 months. Radiographic images were used for determining the navicular bone radiometric measurements. The same measurements were then obtained on fresh specimens at the end of the study. The following radio and morphometric measurements were obtained: articular surface width (D1), flexor surface width (D2), length of the navicular bone (D3) and flexor surface thickness (D4). There were no apparent radiographic or gross changes on the navicular bone in experimental animals. Radiometric and morphometric measurements were also similar in control and experimental animals. Results of this study showed that there are no detrimental effects, or abnormal remodeling of the navicular bone due to NBSL desmotomy in donkeys. Results of this study will help veterinarians and practitioners to accurately follow-up on cases radiographically, where NBSL desmotomy was performed. M. Daradka, Z. Bani, A. Ismail and A. Almomany, 2015. A Study of the Effects of Desmotomy of the Navicular Bone Suspensory Ligament on Radio-Morphometric Features of the Navicular Bone in Normal Donkeys (Equus asinus). Journal of Biological Sciences, 15: 45-49. Navicular bones or the distal sesamoids of the equine forelimbs are canoe-shaped small bones with a horizontally-oriented long axis (Daradka, 2000; Denoix, 2000; Waguespack and Hanson, 2010). The bone is supported in its position on the palmar aspect of the distal interphalangeal joint by several ligaments (Daradka, 2000; Denoix, 2000; Waguespack and Hanson, 2010). Firstly, the Navicular Bone Suspensory Ligament (NBSL) which is a thick horizontal band runs along the palmer edge of the navicular bone with medial and lateral branches that extends proximally on each side of the second phalanx and insert on the distal end of the first phalanx (Daradka, 2000; Denoix, 2000; Waguespack and Hanson, 2010). Secondly, the collateral ligaments of the distal interphalangeal joint (which includes, a medial and lateral ligament) and thirdly, the impar ligament (Daradka, 2000; Denoix, 2000; Waguespack and Hanson, 2010). Navicular bones provide constant insertion angle to the deep digital flexor tendon into the third phalanx and provide additional functional area to the articular surface of the distal interphalangeal joint (Daradka, 2000; Denoix, 2000; Waguespack and Hanson, 2010). Navicular Bone Suspensory Ligament (NBSL) desmotomy is a common surgical procedure that is used to alleviate pain related to navicular diseases (Wright, 1993; Smith et al., 2007; Waguespack and Hanson, 2010; Auer and Stick, 2011). Wright (1993) reported results in 118 horses treated by NBSL desmotomy and found at 6-month follow up that 76% of the horses were sound. The aim of this study was to investigate the effects of desmotomy of the Navicular Bone Suspensory Ligament (NBSL) on radio-morphometric features and on remodeling of the navicular bone in normal donkeys. The experimental protocol used in this study was approved by Animal care and use committee at Jordan University of Science and Technology (No. 0043/2002). Twenty normal adult, local breed donkeys (Equus asinus) aged between 5 and 7 years and weighing 120-150 kg were used in the experiment. The donkeys were housed in one group at the veterinary health center of the Faculty of Veterinary Medicine at Jordan University of Science and Technology in a fenced yard with sheltered area available. They were fed 3 kg barley/day/animal and chopped wheat hay adlib with free access to fresh water. All donkeys were clinically healthy, free of lameness or any hoof wall or conformational abnormalities. All animals' hooves were trimmed, cleaned and their frog's central and collateral sulci packed using dough and covered by transparent adhesive tape prior to radiographic imaging. Three radiographic views (lateromedial, dorsopalmar and palmaroproximal- palmarodistal oblique) were obtained for all animals as described before Denoix (2000), Flavio et al. (2003). Experimental animals were divided randomly into two groups: Group 1 (n = 5) used as controls. Group 2 (n = 15), used for desmotomy, all animals were euthanized twelve months after surgery. Experimental animals were fasted for 12 h prior to surgery. The right foreleg was clipped from the carpal joint to the coronary band and hooves were trimmed and cleaned before surgery. Animals were premedicated using 1.1 mg kg1 xylazine hydrochloride (Xylaject, Egypt) intravenously. General anesthesia was then induced by intravenous injection of 2.2 mg kg1 ketamine (ketamine, Holland) and maintained by continuous intravenous injection of 10% solution of thiopental sodium at a dose of 1 g/90 kg h1 (Pentothal, Italy). The hooves of the right forelimb and the area distal to the carpal joint were prepared for routine aseptic surgery. A tourniquet was then applied at the distal end of metacarpus and medial and lateral desmotomy of the navicular bone suspensory ligaments was performed as described by Wright (1993). Briefly, a 2 cm straight vertical skin incision was made midway between the common digital extensor tendon and the alar cartilage. The incision was extended approximately 5 mm above the coronary band to the level of the eminence on the proximal phalanx. After correct identification of ligament, a small curved hemostat was passed in a dorsopalmar direction under the ligament and the ligament is severed using scalpel blade. The subcutaneous tissues and skin incision were then closed routinely. The second navicular suspensory ligament in the same limb was desmotomized in the same way. A sterile non adhesive was bandage was applied to the surgical site and changed every 48 h for 12 days. Sutures were removed after 21 days. Hand-walking exercise for 20 min was performed 24 h after surgery and gradually increased up to one hour for 3 weeks. Animals were treated postoperatively with penicillin/streptomycin (pen-strep, Norbrook Laboratories) at 10,000-30,000 IU kg1, IM, Bid and gentamycin (Alfamycin, AlfaMedic) at 3-6 mg kg1, IV, Bid for 5 days. Pain due to the surgery was managed by administering flunixin meglumine, (Finadyne, Schering Plough Animal Health) at 1.1 mg kg1, IV daily for 10 days. All animals were administered anti tetanus prophylaxis before surgery. Three radiographic views (lateromedial, dorsopalmar and palmaroproximal- palmarodistal oblique) were obtained for all animals including the controls. Radiographs were taken while the animal is standing according to the following schedule: before surgery, post-operatively and then every 4 weeks for 12 months. Radiographic images of the navicular bone in experimental animals and controls were evaluated for the presence of abnormal bone remodeling at different time points following the surgery. In addition, the following radiometric measurements were obtained (Fig. 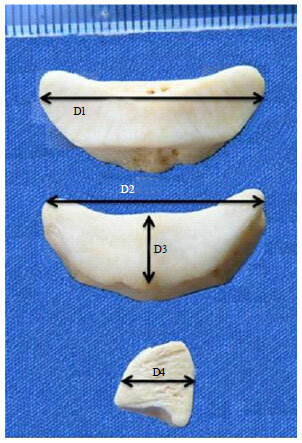 1): Articular surface width (D1), which was obtained from the dorsopalmar view, flexor surface width (D2), which was obtained from the palmaroproximal-palmarodistal oblique view, length of the bone (D3), which was obtained from the dorsopalmar view and the flexor surface thickness (D4), which was obtained from the lateromedial view. Radiographs were scanned into computer software and the measurements were obtained using digital imaging technique (Image J, National Institutes of Health, USA). Individual measurements were recorded in millimeters. At the end of the experiment (12 months after surgery), all animals were euthanized using an injectable anesthetic overdose. The forelimbs were collected and the hoof capsule was removed as described previously (Daradka, 2000). The Deep Digital Flexor Tendon (DDFT) was exposed by sagittal incision of the frog and digital cushion. Then DDFT was dissected away to expose the third phalanx. The navicular bone was then exposed entirely and the suspensory ligaments were identified and dissected. The Impar ligaments were incised from their third phalanx insertion and the collateral ligaments dissected from the second phalanx, then navicular bone was reflected proximally. The navicular bones were cleaned, dried and gross morphometric measurements of D1, D2, D3 and D4 were obtained (Fig. 1). Measurements were obtained using a caliper and recorded in millimeter. Student t-test was performed to examine the mean difference of bone measurements before and after desmotomy. Statistical analysis was performed using SPSS version 10.0 computer program (SPSS, Chicago, IL). Differences were considered statistically significant at p value <0.05. None of the experimental animals showed any signs of pain or discomfort in the immediate post-operative period. The surgery did not appear to affect the middle or distal interphalangeal joints, the navicular bursa, collateral ligaments orientation or the angel of the donkey's foot. Gross evaluation of the surgical site and the dissected bone revealed fibrous tissue formation and adhesion at the site of the ligament that mimicked the normal ligament in location. Radiometric measurements of the navicular bone obtained on the radiographic images were similar to the morphometric measurements obtained from the gross specimens of the bone. The mean and standard deviation of navicular bone measurements D1, D2, D3 and D4 obtained radiographically and grossly are presented in Table 1. There were no statistically significant differences (p>0.05) between navicular bone measurements before surgery and after surgery and between the 2 groups of animals. Radiographic images of the navicular bone in experimental animals were evaluated for the presence of abnormal bone remodeling at different time points following the surgery. On the lateromedial view, both extremities of the navicular bone are superimposed. A well-defined medullary cavity is visualized. The flexor surface of the bone in this view is convex palmarly with smooth margins. The joint space between the navicular bone and the distal phalanx is parallel with a convergent joint sometimes present (Fig. 2). On the dorsopalmar view, the navicular bone appeared uniformly opaque, spindle-shaped, symmetric with bluntly pointed extremities. The proximal border is smooth and variable in shape from concave, undulating and straight or convex. The distal border has a variable number of cone-shaped, radiolucent nutrient foramina (Fig. 3). On the palmaroproximal-palmarodistal oblique view, a well-defined medullary cavity of uniform trabecular pattern with 4-5 small radiolucent foramina may be seen. There is a cortex surface of homogeneous opacity and uniform thickness centrally, with some thinning peripherally. The flexor surface is smooth with a prominent central eminence. A small crescent-shaped radiolucency may be seen within the cortex of the central eminence, representing a normal midsagittal synovial fossa. The ends of both extremities are rounded, being variably superimposed over the palmar processes of the distal phalanx. None of the above features were different among animals in different groups and there were no abnormal radiologic signs found affecting the navicular bone in experimental animals. The horse's hoof and navicular bone anatomy has been extensively studied previously (Daradka, 2000; Denoix, 2000). Navicular diseases in horses, have also received a fair amount of literature (Denoix, 2000; Smith, 2008; Bell et al., 2009; Scandella et al., 2010; Waguespack and Hanson, 2010, 2011; Auer and Stick, 2011). On the other side, although hoof lameness is not uncommon, navicular syndrome has not been reported yet in donkeys (Flavio et al., 2003). Seemingly, hoof and navicular bone anatomy in horses and donkeys share the same features, the normal gross and radiological description of the bone have never been reported in this species. The donkey (Equus asinus) belongs to the equidae family. Donkeys have special characteristics such as easy to handle, cheap, high pain threshold, small body weight, solid with good quality hoof and low maintenance. The closeness of its anatomy and physiology to that of the horse makes it a good model to represent the horse in clinical trials (Flavio et al., 2003). In this study, it can be concluded that desmotomy of the NBSL in donkeys is a good model for studying the effect of this common surgery on navicular bone remodeling in the horse. In veterinary literature, desmotomy is traditionally performed to relief the tension on tendons (e.g. anterior check ligament, inferior check ligament) and joints (Alexander et al., 2001; Auer and Stick, 2011). Desmotomy of the suspensory ligament of the navicular bone is also used to relief the tension on navicular bone in animals suffering from navicular syndrome (Denoix, 2000; Alexander et al., 2001; Smith, 2008; Bell et al., 2009; Scandella et al., 2010; Waguespack and Hanson, 2010, 2011; Auer and Stick, 2011). The outcome of navicular bone suspensory ligament desmotomies reported by Wright (1993), were that 66-71% of animals got back to their normal activities within 6 months after surgery. In this study, it was apparent that because of the fibrous tissue and adhesion formation at the site of the ligament, the pressure relief from the bone would not be permanent and the severed ligament may have restored full function after while, following the surgery. None of the published research concerning desmotomy of the NBSL presented solid radiological proof of changes affecting the navicular bone due to the surgery. In this study, therefore, the radiologic features along with morphometric measurements of the bone before and after surgery were reported for the first time in literature. According to published clinical data and scientific research, navicular syndrome is traditionally managed by NBSL desmotomy accompanied with the administration of anti-inflammatory drugs, vasodilators and stall rest (Denoix, 2000; Alexander et al., 2001; Smith, 2008; Bell et al., 2009; Scandella et al., 2010; Waguespack and Hanson, 2010, 2011; Auer and Stick, 2011). In this study, we were able to demonstrate that adhesion formation at the site of the NBSL occurs after desmotomy which means that most likely the improvement in horses with navicular syndrome following such treatment was not a result of desmotomy per sec. In this study, 12 months of close clinical monitoring and serial radiographic evaluations did not reveal any detrimental effects or abnormal remodeling of the navicular bone due to NBSL desmotomy. Furthermore, the results showed no statistically significant differences in any of the bone radiometric or gross morphometric measurements between the control and experimental animals. Alexander, G.R., K.T. Gibson, R.E. Day and I.D. Robertson, 2001. Effects of superior check desmotomy on flexor tendon and suspensory ligament strain in equine cadaver limbs. Vet. Surg., 30: 522-527. Auer, J.A. and A.J. Stick, 2011. Equine Surgery. 4th Edn., WB Saunders Publishing, St. Louis, USA., ISBN-13: 978-1437708677, Pages: 3104. Bell, C.D., R.D. Howard, D.S. Taylor, E.D. Voss and N.M. Werpy, 2009. Outcomes of podotrochlear (navicular) bursa injections for signs of foot pain in horses evaluated via magnetic resonance imaging: 23 cases (2005-2007). J. Am. Vet. Med. 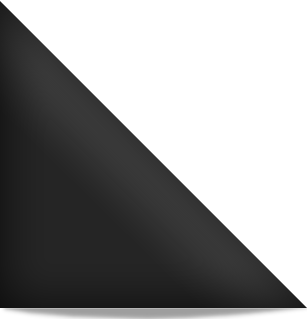 Assoc., 234: 920-925. Daradka, M., 2000. The equine hoof, growth, repair and dimensions. Ph.D. Thesis, The University of Queensland, Australia. Denoix, J.M., 2000. The Equine Distal Limb: An atlas of Clinical Anatomy and Comparative Imaging. Manson Publishing Ltd., London, 9781840765267, Pages: 400. Flavio, R.A., C.G. Porfirio and N.B.M. Arani, 2003. Clinical and radiographic evaluation of the bone diseases in distal forelimb region of the donkey (Equus asinus). Rev. Educ. Contin., 6: 42-52. Scandella, M., S.S. Lazzaretti, D. de Zani, M. Cassano, D.D. Zani, G. Ravasio and M. Gualtieri, 2010. Tenoscopy of the navicular bursa: A new therapeutic approach for horses affected by palmar pain syndrome. Endoscopic technique review and personal experiences. Vet. Res. Commun., 34: S125-S129. Smith, M.R.W., 2008. Surgery relevant to palmar foot pain. Proceedings of the 47th British Equine Veterinary Association Congress, September 10-13, 2008, Liverpool, pp: 35-35. Smith, M.R.W., I.M. Wright and R.K.W. Smith, 2007. Endoscopic assessment and treatment of lesions of the deep digital flexor tendon in the navicular bursae of 20 lame horses. Equine Vet. J., 39: 18-24. Waguespack, R.W. and R.R. Hanson, 2010. Navicular syndrome in equine patients: Anatomy, causes and diagnosis. Compend. Continuing Vet. Educ., 32: E1-E14. Waguespack, R.W. and R.R. Hanson, 2011. Treating navicular syndrome in equine patients. Compend. Continuing Vet. Educ., 33: E2-E10. Wright, I.M., 1993. A study of 118 cases of navicular disease: Treatment by navicular suspensory desmotomy. Equine Vet. J., 25: 501-509.